A partial Achilles tendon rupture can occur in athletes from all sports but particularly in running, jumping, throwing and racket sports. The tendon will not completely tear and it may not be noticed until the activity is stopped. Sharp Achilles pain and stiffness are two of the main symptoms, which may only appear as the muscles cool down after exercise. Symptoms include sudden sharp pain in the Achilles tendon. Sometimes though, the athlete may not feel pain at the time of the tear but later on or the next day when the tendon has cooled down and stiffened up. When returning to exercise after a short period of rest, there may be a sharp pain which disappears when warmed up only to return when stopped. Stiffness in Achilles tendon first thing in the morning may be felt as well as a small swelling in the tendon. Thompson’s test is used to check for a total rupture of the achilles tendon, which may not always be obvious to the patient at the time. 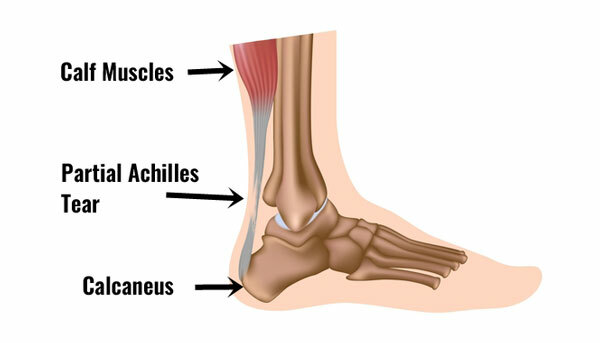 The Achilles tendon is the large tendon at the back of the ankle. Because of the strong lever system in the foot and ankle, huge forces go through the tendon when running and jumping. A partial Achilles tendon rupture can occur in athletes from all sports but particularly running, jumping, throwing and racket sports. The tendon tears but not completely. Scar tissue will form which is likely to lead to inflammation of the tendon. Often the athlete will not feel the Achilles tendon rupture at the time but will become aware of it later when the tendon has cooled down. Apply cold therapy or R.I.C.E. (Rest, Ice, Compress, Elevate) for the first two to three days. See a sports injury specialist or doctor who can advise on treatment and rehabilitation. A proper diagnosis is essential. If the rupture is a complete Achilles tendon rupture then immediate surgery is usually indicated. Thompson’s test is one way of determining if a total rupture may be present. Correctly diagnose the injury – Thompson’s test is one way of assessing the Achilles tendon. Taping the Achilles tendon can relieve the strain on it aiding the healing process. Electrotherapy such as ultrasound can help reduce pain and inflammation. A full Achilles tendon rupture rehabilitation program is required which will include stretching as well as strengthening exercises. A doctor may also prescribe anti-inflammatory medication such as ibuprofen or if the tear is particularly bad it may be immobilized in a plaster cast for 4 to 6 weeks. Very severe or complete ruptures may require surgery. The aims of rehabilitation are to control initial pain and swelling, improve mobility and strength then gradually return to full fitness. Apply cold therapy. This can be in the form of ice. Do not apply directly to the skin – place a wet tea towel around the ice or use a specialist product. Apply compression after or during the cold therapy to help reduce swelling. NSAID (Non-Steroidal Anti Inflammatory Drugs (e.g. Ibuprofen) may help reduce the inflammation in the early stages. It is important to always check with your Doctor before taking any medication. You should not take Ibuprofen if you have asthma. Avoid taking medication for more than a week. The effectiveness may be reduced later in rehabilitation and may even hinder healing. Rest the injury from aggravating activities. If the athlete cannot walk without pain then they may need to use crutches. When the athlete can tolerate walking, place a 2cm heal raise into shoes which will raise the heal, shorten the Achilles tendon and reduce the load on the tendon. Continue to rest the tendon until able to tolerate a strengthening programme. With an injury of this kind, it may be a month or more before the athlete can attempt strengthening of the tendon. Taping the Achilles tendon may help to reduce the load on it as the athlete returns to walking, especially if they have no choice and have to get about for example at work. It may be a month before swelling is reduced and the injury has healed enough to progress into stretching and strengthening exercises. When swelling has gone down and pain is reduced the athlete may be able to begin to stretch the tendon. It may be as soon as a week after injury but it may be up to a month depending on severity. Begin with mobility exercises as soon as pain will allow. This may be within a few days but could be over a week depending on how bad the injury is. Assessing flexibility: A good starting point is to assess the flexibility of the calf muscles. One method of assessing calf muscle flexibility is to apply gentle pressure to the forefoot with the patient sitting with the leg out straight in front. There will be a point where the resistance noticeably increases as the muscle begins to stretch. It is likely the therapist will feel this before the patient feels a stretch on the calf muscles. Active calf stretch: Active stretching is a good exercise to begin with as it applies only a gentle stretch to the muscle. Muscles work in pairs and by contracting the muscles in the front of the lower leg, the muscles at the back must relax. Gastrocnemius stretch: To stretch the big gastrocnemius muscle the back leg must be kept straight. Stand with the leg to be stretched at the back and hands on a wall at shoulder height. Bend the front knee and lean forward, keeping the back knee straight and pushing the heel down into the floor. Soleus muscle stretch: To stretch the deeper soleus muscle the knee of the leg to be stretched needs to be bent. This is because the soleus muscle attaches below the knee and bending the knee allows the gastrocnemius muscle to relax leaving the soleus on stretch. Balance exercises should be performed as early as possible in the rehabilitation of this injury. When a tendon or ligament is torn balance is usually impaired, leaving the ankle more at risk of future injuries. Balance boards are great for this. When pain and swelling have gone then strengthening exercises can begin. Start very slowly and progress slowly (double leg heel drop taking most of the weight on the uninjured leg). 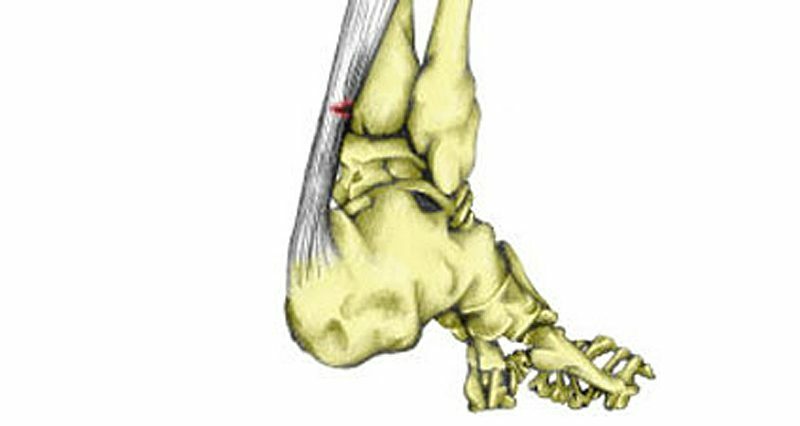 It is important that the tendon is strengthened in the stretched position by allowing the heels to drop below the toes. Continue stretching throughout the rehabilitation process. Stretch well before and after strengthening sessions. Stretching exercises can be done on a daily basis, especially if the loads are light in the early stages. Strengthening should be continued for many weeks after you have returned to full fitness. Apply ice to the tendon at the end of a strengthening session to help prevent inflammation. Seated Calf Raise: Sit on a chair and raise up onto your toes. Again this is a gentle exercise that will strengthen the Soleus muscles. Resting a weight on the knees will increase the resistance. Start with 3 sets of 10 twice a day and increase a little every two or three days when you are sure there has been no adverse reaction (pain). Resistance band calf exercise: This is a gentle exercise to start with. Hold a loop of resistance band and use it to apply resistance as the foot is pointed away (plantar flexed). Start with just 3 sets of 10 once a day and build up to 3 sets of 20 three times a day. If it does not hurt the next day then increase the load. You may fine with this one you can increase the resistance quite quickly. Calf Raise: Stand on the edge of a step and lower the heels down, both at the same time. You can adjust the pressure on the injured leg by taking most of your weight on the good leg. Repeat this exercise as many times as is comfortable. Do not over-do it, especially in the early stages. It is better to do too little rather than risk causing inflammation to the tendon. Repeat the exercise twice daily. Progress to doing two and then three sets at a time. Apply cold therapy to the Achilles tendon after exercise. This exercises can be made more difficult by doing single leg calf raises. Do not do more on the good leg then the injured leg can cope with. Walking Calf Raise: This exercise is more specific. Walk around pushing yourself up onto your toes each step. Start doing just 20 steps and increase each day until you can do 100. Do not progress too fast. A little each day. Be patient. It is important to continue to do exercises 3 or 4 in addition to this one as it is important that the Achilles tendon gets strengthened in a stretched position. Sports massage to the Achilles tendon can be of benefit in the later stages of a partial rupture of the Achilles tendon although professional advice should be sought as to the timing. Massage techniques for the calf muscles should also be used to stretch and relax the Gastrocnemius and Soleus muscles, which in turn takes the strain off the Achilles. When the ankle has regained full flexibility, there is no pain or swelling and strengthening exercises can be tolerated without adverse reaction then a gentle running programme can begin. This may be up to three months after the initial injury depending on severity. Start gentle jogging on a firm surface. Gradually build up until you can comfortably jog for 45 minutes. It is unlikely that you will be able to return to competition within four to six months. Below is an example of a gradual return to running program. Continue this gradual progression until you can confidently run and resume normal training. Gradually increase the duration of your runs. No more than 10 % per week is usually recommended. If your sport demands sprinting then gradually increase the speed. Continue with the stretching and strengthening programme. It is important to do these even if you do not gain pain at this stage. Continue for at least three months. Continue to ice the tendon after training. You should now be ready to start back in full training but never neglect stretching and strengthening of the Achilles tendon or the injury might return.